Hawke Sidewinder 6-24x56 FFP Scope - FREE S&H - Indiana Airguns! Hawke Sidewinder 6-24×56 FFP Scope is a new generation of Hawke Sidewinder scopes offered in First Focal Plane (FFP). The turrets and the reticle in MRAD / Mil units of measure. The glass etched reticle has 5 levels of brightness. 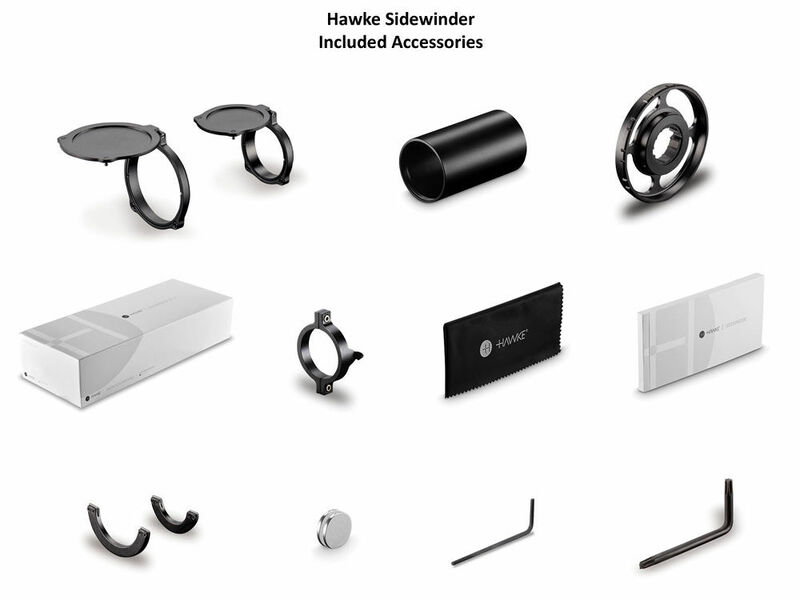 Hawke Sidewinder 6-24×56 FFP Scope is a new generation of Hawke Sidewinder scopes offered in First Focal Plane (FFP). These new FFP scopes have both the turrets and the reticle in MRAD / Mil units of measure. The glass etched reticle has 5 levels of illumination in either red or green. Speaking of turrets, they are push-pull locking and resettable with positive 1⁄10 MRAD click values. Every 10 clicks on the turret will measure exactly 1 mil spacing on the reticle, also known as 1 MRAD. Because of FFP this is true regardless of the magnification you use. Zeroing in and staying on target is quick and reliable. The Hawke Sidewinder 6-24×56 FFP Scope offers a set it and forget it ocular adjustment. You can quickly achieve sharp reticle focus, then lock it down to avoid accidentally adjustments. 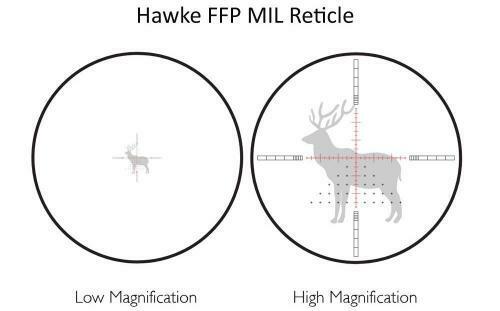 The Hawke FFP Mil reticle was developed specifically for first focal plane optics and based around the common principles of mil spaced reticles. 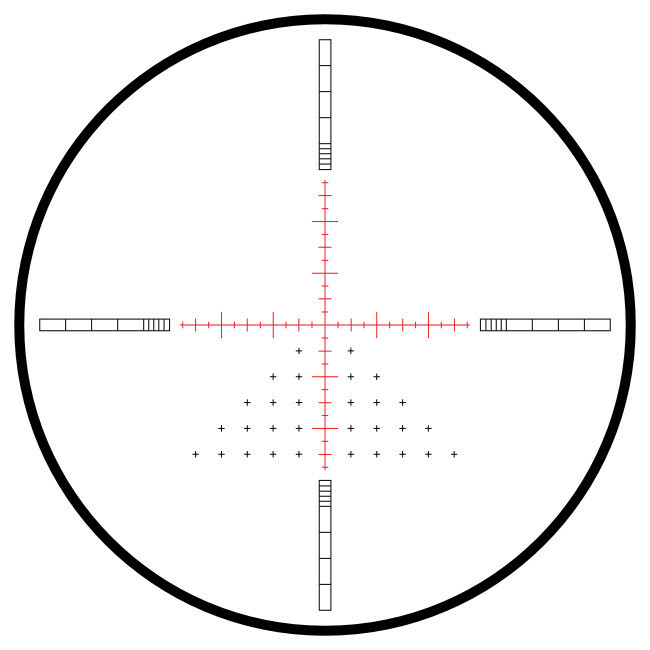 With half mil spaced markings out beyond 5 mil in all directions, the FFP Mil is a versatile reticle that provides aim points no matter how extreme the conditions. Due to oscillating recoil, air guns are harder on scopes than any center fire rifle. 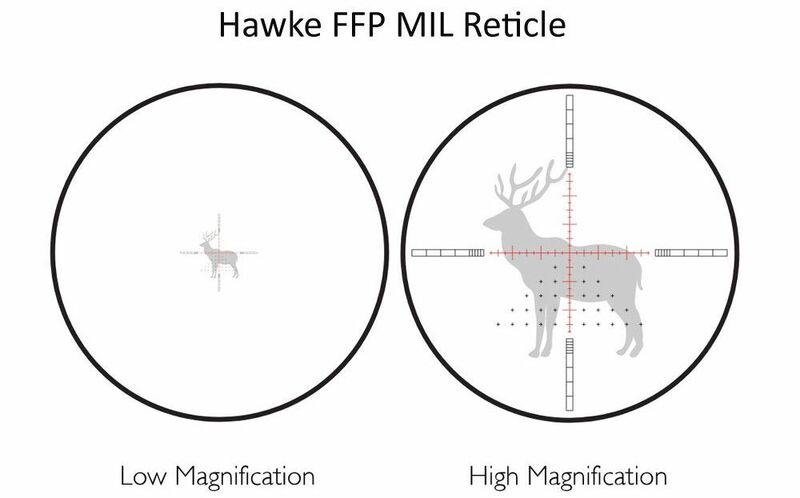 Hawke Optics build scopes strong enough to take it. Scope rings are NOT included.